propelled by the movement of a child. It is often supplied with a variety of attached interactive toys. Its primary purpose is to support an infant as the child moves around in a standing position within the frame. Baby walkers are intended for children who have not yet learned to walk. The mandatory standard covers design, construction, performance and labelling requirements for baby walkers. Consumer Protection Notice No.1 of 2013 sets out the mandatory requirements for baby walkers. A baby walker must have a braking mechanism to stop it falling down steps and stairs. Baby walkers must comply with the mandatory standard performance requirements as specified in clauses 6.1, 6.3 and test methods in Clauses 7.3 and 7.6 of ASTM F 977-12. Clause 6.1 specifies tests for baby walkers to resist tipping over an obstacle and to resist tipping over when a child leans out of the baby walker. Clause 7.3 is the testing method. Clause 6.3 specifies testing the braking mechanism to prevent the baby walker falling down stairs. Clause 7.6 is the testing method. Clause 8.2 specifies the labelling requirements. have a safety alert symbol. The word WARNING must be at least 5 mm high and the rest of the words must be in letters at least 2.5 mm high. In the stairs warning, the safety alert symbol and the word ‘WARNING’ must be at least 5 mm high and must be black lettering on an orange background surrounded by a black border. The rest of the words must be characters whose upper case is at least 2.5 mm high and must be black lettering on a white background. 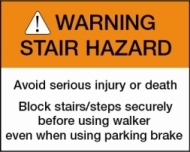 Use only on flat surfaces free of objects that could cause the walker to tip over. To avoid burns, keep the child away from hot liquids, ranges, radiators, space heaters, fireplaces, etc. Warning: Parking brake use does not totally prevent walker movement. Always keep child in view when in the walker, even when using the parking brakes (only for baby walkers equipped with a parking brake). in sans serif style font.